If you have recently introduced a puppy into your world then you’ll know the fun and joy this bundle of inquisitive energy can bring. Like any young animal, he or she will be keen to discover, explore, and find new experiences. This is why the first few months of any puppy’s life are so crucial to their social development into a happy, healthy and sociable dog. That’s why puppy preschool is a great idea! Puppies learn at a rapid rate and the experiences they have during this period have a major and lasting impression upon them. To make the most of this period, it’s important that your puppy starts to learn positive behaviours and boundaries, and understands and responds to the basic commands you’ll want to use to keep them safe in that big outside world. It’s also vital that they can begin to interact in a positive way with other dogs. This is a fun and informative way for puppy (and perhaps you too) to learn. We’ll teach your puppy how to respond to the important ‘sit’ and ‘recall’ commands. At the same time, we’ll show you how to offer both positive reinforcement and praise to encourage your puppy to respond. We will also discuss how to best help your puppy grow and develop by talking about issues such as puppy diet and appropriate parasite control. 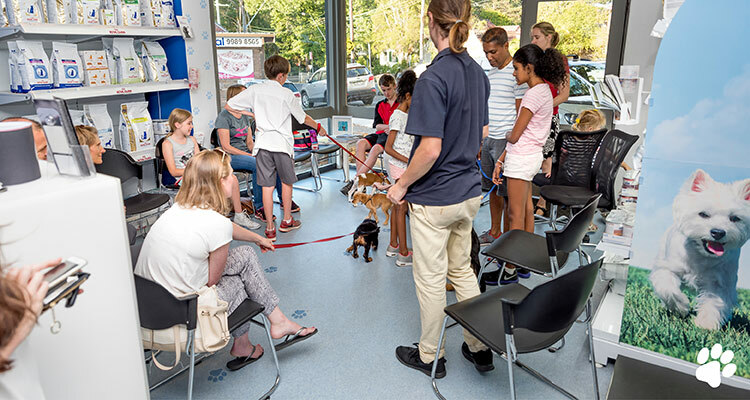 While you build up a range of effective communication skills, your puppy will also experience the absolute joy of interacting, socialising, and having boundless young fun with a wide range of different puppies of all shapes and sizes. He or she should have a positive can-do attitude – well what puppy doesn’t – and obviously their vaccinations need to be up-to-date. Of course, our Normanhurst Vet Practice team can handle this for you, if any are due or necessary. Our popular courses are held over four consecutive Wednesday evenings. Each session lasts a full hour and runs from 6-7pm. We ask you to bring some treats and snacks along for your puppy, as you’ll know best what he or she likes. Please also bring your puppy into our clinic with a lead as this will help to maintain a small level of control and will allow your puppy to become used to walking with a lead. The classes are conducted members of our team Head Veterinary nurse Michele and Veterinary Nurse Luke. Both are brilliant at gaining rapport with the puppies, including the more nervous or unsure animals. Both Michele and Luke really enjoy watching the puppies grow up into adults, because as time goes on, the dogs remember the positive experiences of Puppy School and so really enjoy coming into our practice. You may have seen Romper, Luke’s dog, an American Staffy who regularly visits us and is a very popular member of our team! Are you ready for Puppy Preschool? To check future dates, book your place on one of these popular classes, or to ask any questions, please give our Normanhurst Vet Practice team a call now at our clinic on 02 9489 6000. Practice are available to help.